Tower: Red brick; approximately 160 feet; six feet thick at base, one foot thick at top; base, built upon horizontal yellow pine logs, extended 18 feet into ground; inside of tower was painted white, with the steps mahogany brown. Light: fixed white; light changed to flashing in 1914; flashing apparatus consisted of brass shutters that hid the light for 2 1/2 seconds and clockwork mechanism that required winding every 1 1/2 hours; light originally lit with lard oil (? ), later used kerosene oil, then kerosene vapor. 1854, August 3: $35,000 appropriated for a light house "near Great West Bay, Long Island, N.Y."
1855: Sites for "the light-houses at Pondquog Point (Great West bay, Long Island,) Horton's Point, Long island, and Race Point, Fisher's island" were surveyed and the locations of the lights determined. 1856: The Annual Report states that "the commencement of the erection of the light-houses authorized for Great West bay, Horton's Point, Lloyd's harbor, Race Point... delayed for want of valid titles to the respective sites." 1856, August 18: An additional $12,000 is appropriated. 1857: "First class light-house at Great West bay will be completed by 30th November." 1858, January 1: Light first lit. 1866, July 28: $5100 is appropriated for repairs at "Esopus, Four-mile Point, Beavertail, Passaic, Black Rock, & Great West Bay." 1867: "Brick work on tower repointed, and together with foundation of keeper's dwelling, covered with three coats of cement-wash.." Other repairs were also performed. 1872, June 10: $4600 appropriated for repairs at "Sands Point, Great West Bay & Fire Island." 1874: The repairs covered by the June 1872 appropriation were completed. 1889: "A new line fence was built and other fences repaired. Repairs to dwelling and barn were also made." 1890: An oil house was built. 1891: A new barn was built and the keeper's quarters received a new shingle roof. 1894: A picket fence was put around the front yard of the keeper's quarters. 1899: A telephone with the life-saving station was established by underwater cable. The connection was broken in December, but was repaired. 1901, November 4: The Light-House Board considers changing the characteristic of the light from fixed to flashing, and the electrification of the light. 1901, December 6: The Secretary of the Treasury sends a letter to the Speaker of the House of Representatives requesting funds to make the changes suggested by the Board. 1907, February 19: The light's intensity was increased by changing the illuminant from oil to incandescent oil vapor. 1914, April 8: Fixed light replaced with flashing light. 1931, August 1: Just after sunrise, the light is extinguished for the last time. Current use: No longer in existence. The surrounding area: Ponquogue Point is south of Hampton Bays, at the base of the Ponquogue Bridge. The bridge takes one over Shinnecock Bay onto Dune Road. This is a lovely area for those who love the beach and/or birdwatching. Check the NY area rare bird alert beforehand. If you visit this spot early in the day, you'll still have time to visit Cedar Point and Montauk Point. Public access? Although there are no remains of the light to be seen, aside from a 1902 oil house; you may visit the area freely. 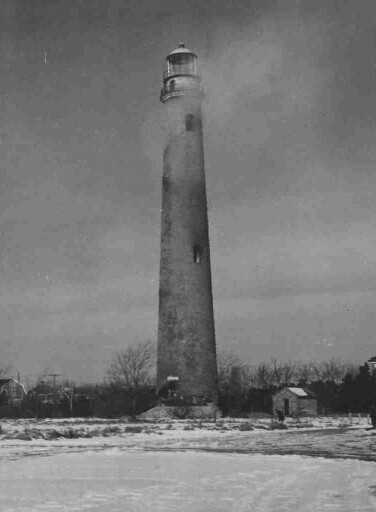 Other information: This light was called Shinnecock Light, but was also known as Ponquogue Light and Great West Bay Light. Ponquogue Point was the inlet to Shinnecock Bay in the 1800s. Movement of sand bars and changes caused by storms often change the face of Long Island (The Gardiner's Island, Montauk Point, Cedar Island lighthouses and others show further evidence of this). Who to Contact: I have much more information about this light, including keepers' names, Coast Guard memos, the story of how this light actually caused a fatal shipwreck on February 28th, 1858, and more pictures. Stay tuned.